Polytetrafluoroethylene (PTFE) is a fluorocarbon-based polymer, known more commonly as Dupont’s brand name Teflon®. The enhanced electrical properties, high-temperature capabilities and chemical resistances of this thermoplastic make it a favorite for backup rings, coatings, distribution valves, electrical insulation applications and more. Our latest machining guide discusses what goes into machining Teflon and how its considerations differ from other manufacturing options such as metal machining, injection molding, and 3D printing. Read on to learn more about Teflon’s machining, applications and properties in AIP’s informational polymer brief below, starting with the difference between working with a thermoset and a thermoplastic. We’ve already said that Teflon is a thermoplastic, but what does that mean exactly? All polymers can more or less be divided into two categories: thermoplastics and thermosets. The main difference between them is how they react to heat. Thermoplastics like Teflon, for example, melt in heat, while thermosets remain “set” once they’re formed. Understanding the technical distinction between these types of materials is essential to CNC machining them properly. What type of thermoplastic is Teflon in particular? PTFE is a fluoropolymer, making it a semi-crystalline thermoplastic. As a fluoropolymer, PTFE possesses an inherent high resistance to solvents, acids and bases. Teflon has excellent electric stability in a wide range of conditions and environments, and its coatings are popular in the aerospace sector. Offering excellent chemical resistance and sliding properties, PTFE finds many applications in seals, housings, linings and bearings. Teflon also maintains very good UV resistance, hot water resistance and electrical insulation at higher temperatures. Unfilled PTFE is chemically inert and has the highest physical and electrical insulation properties of any Teflon grade. Mechanical grade PTFE is often made up of reground PTFE and exists as a cost-effective alternative for industries that don’t require high purity materials while providing superior compressive strength and wear resistance to virgin Teflon. There are several different modified PTFE materials available with unique properties. Many of these modified grades offer greatly reduced deformation percentages under load, as well as a lower coefficient of friction. These include glass-filled, nanotube, synthetic mica and carbon-filled grades. Teflon (PTFE) is more commonly used as an additive to numerous other base polymers in order to provide reduced friction and wear properties. Some of the PTFE grades we regularly machine at AIP include FLUOROSINT 207, FLUOROSINT 500, DYNEON, SEMITRON, ESD 500 HR, and SEMITRON PTFE. The process of annealing and stress-relieving PTFE reduces the likelihood of surface cracks and internal stresses occurring in the material. Post-machining annealing also helps to reduce stresses that could potentially contribute to premature failure. AIP’s special annealing process for Teflon is designed to take the specific properties of PTFE into account, and we advise anyone working with PTFE to hire a manufacturer that understands its unique demands. PTFE’s density and softness make it deceptively easy to machine, and in virgin grade, has a temperature range from -450°F to +500°F (-267.7°C to +260°C). Teflon has low strength when compared to materials like Nylon, which has almost two to three times the tensile strength of Teflon. You’ll want to use extremely sharp and narrow tools to work with this material. Teflon’s high coefficient of expansion and stress creep properties can make it difficult to achieve tight machining tolerances. It’s essential to design your application with PTFE’s inherent properties in mind, instead of trying to force the polymer to act against its nature. We also suggest non-aromatic, water-soluble coolants, such as pressurized air and spray mists, to achieve optimum surface finishes and close tolerances. Coolants have the additional benefit of extending tool life as well. Contamination is a serious concern when machining polymer components for technically demanding industries such as medical and life sciences. To ensure the highest level of sanitation down to the sub-molecular level, AIP Precision Machining designs, heat-treats and machines only plastics, with any sub-manufactured metalwork processed outside our facility. Delrin®, also commonly known as an acetal (polyoxymethylene) homopolymer, is an impact and wear resistant semi-crystalline thermoplastic popular for a broad range of machining applications. To list just a few of its impressive qualities, Delrin offers great stiffness, flexural modulus, and high tensile and impact strength. Our latest machining guide discusses what goes into machining Delrin and how its considerations differ from other manufacturing options such as metal machining, injection molding, and 3D printing. How does AIP approach Delrin and its machining process? To start, we’ll explain the difference between machining Delrin, a thermoplastic, and machining thermosets. We’ve already said that Delrin is a thermoplastic, but what does that mean exactly? All polymers can more or less be divided into two categories: thermoplastics and thermosets. The main difference between them is how they react to heat. Thermoplastics like Delrin, for example, melt in the heat, while thermosets remain “set” once they’re formed. Understanding the technical distinction between these types of materials is essential to CNC machining them properly. What type of thermoplastic is Delrin in particular? Acetal homopolymer is a semi–crystalline, engineering thermoplastic. This strong, stiff and hard acetal homopolymer is easy to machine and exhibits dimensional stability and good creep resistance, among several other desirable qualities. Delrin is also known for its superior friction resistance, high tensile strength, and its fatigue, abrasion, solvent and moisture resistance. The latter quality allows Delrin to significantly outperform other thermoplastics like Nylon in high moisture or submerged environments without losing high-performance in the process. In other words, Delrin can retain its low coefficient of friction and good wear properties in wet environments. One of the main reasons for Delrin’s popularity is its sheer versatility. The above blend of unique qualities makes Delrin broadly applicable to various industries in the medical, aerospace and energy sectors. For example, you can machine Delrin for medical implants and instruments, or for industrial bearings, rollers, gears, and scraper blades. It is ideal for smaller applications at temperatures below 250 °F (121°C) and can have centerline porosity. PTFE (polytetrafluoroethylene) filled grades of Delrin is ideal where impact strength and wear capability are of the highest importance. Acetals that are reinforced with glass have a much higher strength and greater heat resistance than other grades of Delrin. 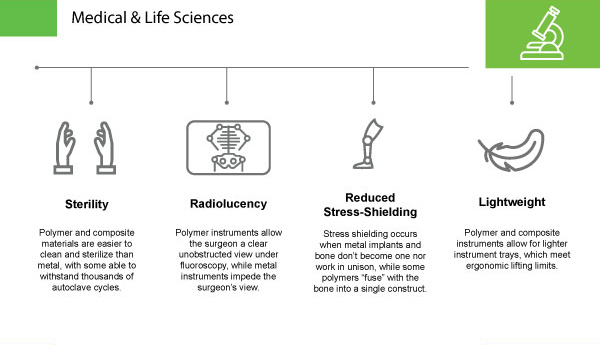 There are FDA-compliant grades of Delrin available for use in medical and food-related applications. It’s true that Delrin is an easy material to work with in terms of machining. It is a very stable material, which makes precise, tight tolerances easier to achieve for this thermoplastic. While machining, keep in mind that Delrin is sensitive to heat at or above 250 °F (121°C). Balance the material removal as best as you can to keep your dimensions stable. We also suggest non-aromatic, air-based coolants to achieve optimum surface finishes and close tolerances. Coolants have the additional benefit of extending tool life as well. Contamination is a serious concern when machining polymer components for technically demanding industries such as medical and life sciences. To ensure the highest level of sanitation down to the sub-molecular level, AIP Precision Machining designs, heat-treats, and machines only plastics, with any sub-manufactured metalwork processed outside our facility. 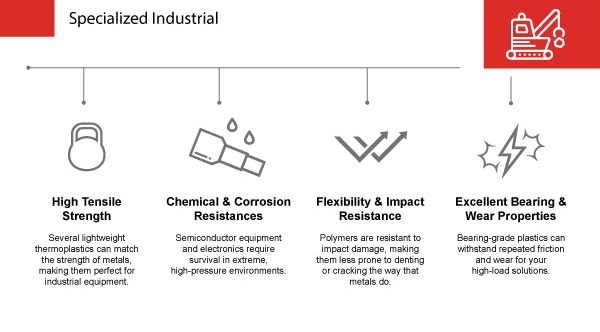 Want to learn more about AIP’s polymer and composite materials? or request a quote here. 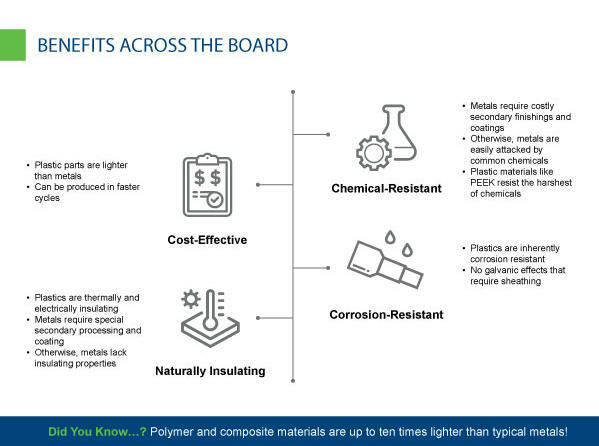 AIP explains the advantages of using plastics over metals in our infographic below, with special emphasis on how each industry benefits from using polymers. Read on to learn all about it from the plastics professionals. Posted in Plastic Machining, Polymer ComponentsTagged 6061-T6, Brass, Bronze, Metal Components, Metal Parts, Nylatron, peek, plastic components, Plastic Parts, Plastic vs Metal, Stainless Steel, Teflon, Titanium, Torlon, ultemLeave a Comment on What are the advantages of plastics over metals? Nylatron® is Quadrant’s trademark name for a whole family of wear resistant and low friction Nylon polymers, most of which are filled with molybdenum disulphide (MoS2) powder. What makes this material popular for industrial and bearing applications is its mechanical properties and impressive wear-resistance. In our latest machining guide, we discuss what goes into machining Nylatron, and how its considerations differ from other manufacturing options such as metal machining, injection molding, and 3D printing. Machining Nylatron: A Plastics Guide shows you how AIP Precision Machining approaches this material and its machining process. To start, we’ll explain the difference between machining Nylatron, a thermoplastic, and machining thermosets. We’ve already said that Nylatron is a thermoplastic, but what does that mean exactly? All polymers can more or less be divided into two categories: thermoplastics and thermosets. The main difference between them is how they react to heat. Thermoplastics like Nylatron, for example, melt as heat is increased to the material’s melt point, while thermosets remain “set” once they’re formed regardless of heat; rather, they simply char or burn. Understanding the technical distinction between these types of materials is essential to CNC machining them properly. What type of thermoplastic is Nylatron in particular? As part of the Nylon family, it is a semi-crystalline, engineering thermoplastic polyamide. Nylatron’s main characteristics include a high mechanical strength, stiffness, hardness and toughness. As a semi-crystalline thermoplastic, Nylatron has good fatigue resistance as well. 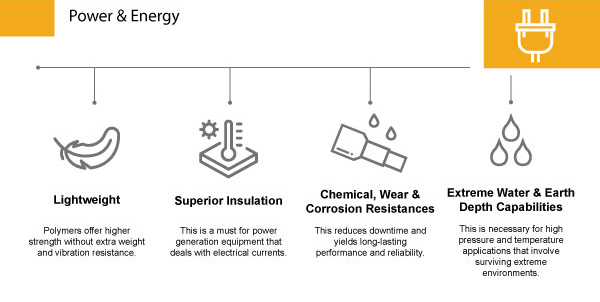 With excellent wear resistance and good electrical insulating properties, it’s not surprising that this material is often used for specialized industrial applications. One feature that’s of special interest to us at AIP is Nylatron’s ease of machinability with high precision. However, it’s also easy to extrude and fabricate. Like Nylon, Nylatron is resistant to chemicals and hydrocarbons; the latter characteristic is especially useful in the oil and gas sector. Add in abrasion resistance, low coefficient of friction and outstanding corrosion resistance and you have a long-wearing material that can serve as a cost-effective replacement for metals and rubber. Also known as MoS2-Filled Type 6 Nylon, this filled Nylatron grade has improved strength and rigidity over other Nylon variants, including a lower coefficient of linear thermal expansion. This is because the MoS2 (molybdenum disulphide) enhances the bearing and wear of the material without compromising its impact and fatigue resistance. This grade is often used to replace cast iron industrial applications, as lightweight Nylatron can both reduce weight and eliminate corrosion. As a result, it’s commonly used for gears, bearings, sprockets and sheaves. This extruded grade of Nylon 6/6 is 30% glass fiber reinforced and heat stabilized to provide improved creep resistance and dimensional stability as well as enhanced strength, stiffness and abrasion resistance. It has almost double the tensile strength of unmodified Nylon 6/6, with an elongation rate of about 1/6th that of unmodified Nylon 6/6. It has good resistance to high energy radiation (such as X-rays or gamma- rays) and allows for higher maximum service temperatures when compared to other grades. Nylatron LIG PA6 is an internally lubricated Nylon grade that can perform up to ten times longer than its unmodified counterpart thanks to its lubricated additives. It strikes an optimal balance of strength and toughness. This makes it work well for industrial and consumable applications including gears, industrial bearings and wear pads. Nylatron NSM is the highest wear resistant thermoplastic available. As a self-lubricating grade of Nylon 6, it’s designed to outperform other wear grade materials and give long-lasting part life for applications that otherwise experience continuous wear and damage, such as bearings and wear pads. Other benefits of Nylatron NSM are its ease of machining, corrosion-resistance and noise reduction. Named for its dark blue color, Nylatron GSM Blue PA6 is the first cast Nylon to combine MoS and oil for the load capacity of Nylatron GSM PA6. This material performs exceptionally in higher pressures and at low speeds of up to 40 fpm. It’s preferred over Nylatron GSM PA6 for slide pads, thrust washers and trunnion bearings due to its 20% lower coefficient of friction, 50% greater limiting PV and its lower “k” factor. High precision applications machined from Nylatron 703XL benefit from its near-zero level of “stick-slip,” which eliminates chatter to allow for an incredible level of control. Nylatron 703XL possesses a good balance of strength and toughness, as well as good mechanical and electrical properties. This grade works well in critical bearing applications for construction and production equipment industries. Nylatron MC901 is a heat-stabilized Nylon 6 grade that offers long-term thermal stability to 260 °F. This material has high toughness, flexibility and fatigue resistance. It is used in many bearing and structural applications, its most popular being gear wheels, racks and pinions. The process of annealing and stress-relieving Nylatron reduces the likelihood of surface cracks and internal stresses occurring in the material. Post-machining annealing also helps to reduce stresses that could potentially contribute to premature failure. We recommend stress relieving Nylons in a nitrogen environment. As stated earlier, Nylatron precision machines easily. This makes it a popular choice for machined industrial components that require precise, tight tolerances. We advise using HSS cutters instead of carbide on Nylatron for its surface finish. Stringer or chip removal during machining of Nyaltron is critical in order to maintain tolerances and surface finish. When under high humidity, or while submerged in water, Nylons can absorb up to 7% by weight of water. This is important to keep in mind for machining Nylatron and designing applications of the material, as this effect can result in dimensional changes and a reduction of physical properties. There are proper design techniques that can compensate for this, so be sure you’re working with a Nylatron expert. Contamination is a serious concern when machining polymer components for technically demanding industries such as aerospace. To ensure the highest level of sanitation down to the sub-molecular level, AIP Precision Machining designs, heat-treats and machines only plastics, with any sub-manufactured metalwork processed outside our facility. If you’ve been to a popular Florida amusement park, then it’s possible you’ve encountered the latest part starring in our “Where Does This Part Go?” series. Posted in Plastic Machining, Polymer Components, Thermoplastic MaterialsTagged AIP Precision Machining, CNC machined parts, machined polymers, plastic machining, polymer materials, precision machined composites, precision machined parts, precision plastic machining, Thermoplastics, Where does this part goLeave a Comment on Where Does This Part Go? Did you know that PPS (or Polyphenylene sulfide) products offer the broadest resistance to chemicals of any high-performance thermoplastic? It’s no surprise that this makes them a popular choice for industrial applications such as wheel bushings, chemical pumps, and compound clamp rings for semiconductor wafers. What goes into machining this thermoplastic, however, and how does it differ from metal machining, injection molding, or 3D printing? 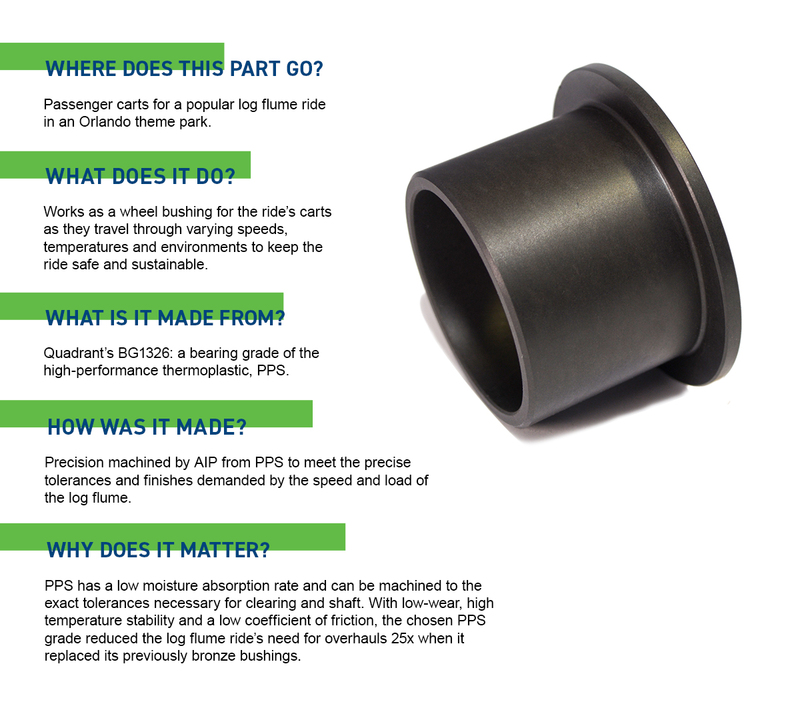 With Machining PPS: A Plastics Guides, AIP provides you with a guide to this material and its machining process. First, let’s start with the basics: thermoplastics vs thermosets. We’ve already said that PPS is a thermoplastic, but what does that mean exactly? All polymers can more or less be divided into two categories: thermoplastics and thermosets. The main difference between them is how they react to heat. Thermoplastics like PPS, for example, melt in heat, while thermosets remain “set” once they’re formed. Understanding the technical distinction between these types of materials is essential to CNC machining them properly. What type of thermoplastic is PPS in particular? It’s a semi-crystalline, high-performance thermoplastic that has an extremely stable molecular structure. The chemical resistance of PPS is often compared to PEEK and fluoropolymers. There’s a lot to like about PPS’s material properties. As we mentioned before, PPS has exceptional chemical resistance that makes its bearing grades especially favorable for the chemical industry or caustic environments. In particular, its resistance to acids, alkalis, ketones, and hydrocarbons lend PPS stellar structural performance in harsh chemicals. Additionally, PPS materials are inert to steam as well as strong bases, fuels and acids. Combine that with a low coefficient of thermal expansion and zero moisture absorption, and you get a material that is ideal for continuous use in corrosive or hostile environments. PPS has replaced stainless steel for a lot of industrial applications for this reason. Most impressively, PPS will not dissolve at temperatures below approximately 200 °C, no matter what solvent is used. In fact, all grades of PPS share UL94 V-0 flammability ratings, without requiring flame retardant additives, resulting in an excellent material for aircraft where flame resistance is paramount. Some grades of PPS that we regularly machine at AIP Precision Machining include Ryton®, Fortron®, TECHTRON®, TECTRON® HPV, TECATRON PVX and TECATRON CMP. The process of annealing and stress-relieving PPS reduces the likelihood of surface cracks and internal stresses occurring in the material. Post-machining annealing also helps to reduce stresses that could potentially contribute to premature failure. AIP’s special annealing process for PPS is designed to take the specific properties of PPS into account, and we advise anyone working with PPS to hire a manufacturer that understands its unique demands. PPS is a fantastic material for machining. Its low shrinkage and stable dimensional properties make it easy to machine to incredibly tight, precise tolerances. A unique characteristic of PPS is that when dropped, it sounds just like a piece of metal hitting the floor. PPS, like many other thermoplastics, is notch sensitive, so take care to avoid sharp corners in design. We recommend carbide tipped cutting tools for working with PPS as they provide an ideal speed and surface finish. We also suggest non-aromatic, water-soluble coolants, such as pressurized air and spray mists, to achieve optimum surface finishes and close tolerances. Coolants have the additional benefit of extending tool life as well. No known coolants attack nor degrade PPS. Contamination is a serious concern when machining polymer components for technically demanding industries such as aerospace. To ensure the highest level of sanitation down to the sub-molecular level, AIP Precision Machining designs, heat-treats, and machines only plastics, with any sub-manufactured metalwork processed outside our facility. What’s the Purpose of Annealing & Stress-Relieving Plastics? Ask the Plastics Professionals at AIP Precision Machining! Do you know why AIP Precision Machining includes stress-relieving and annealing plastics as part of our machining process? We’ve talked about this a bit in our plastic machining guides (like our polymer machining brief on RADEL, but this post serves as a more thorough explanation of annealing does to improve your machined parts. What’s the purpose of stress relieving and annealing plastics, then? 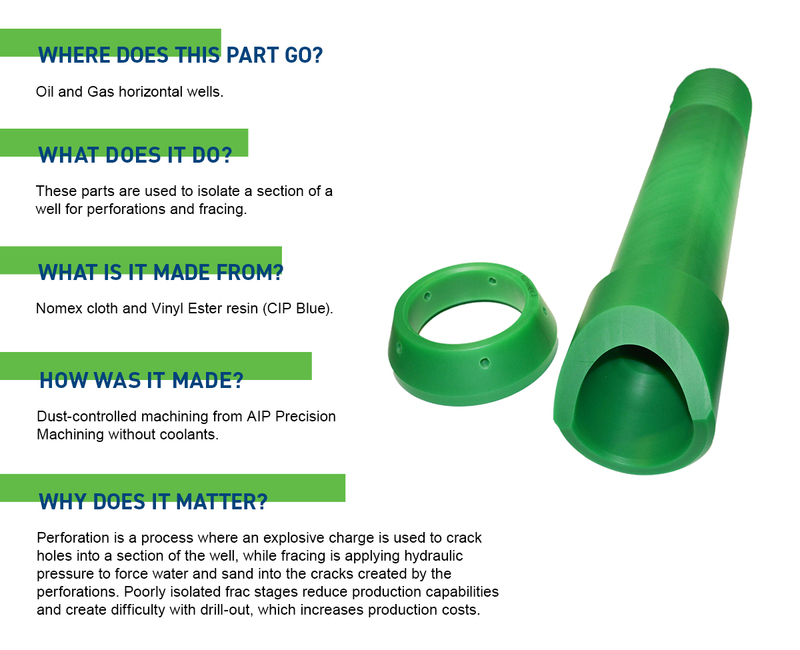 Read on to learn the answer from the plastics professionals at AIP Precision Machining. What is annealing, and how does AIP anneal its plastic parts? Let’s start with the basic definition of annealing: it’s a heat treatment that changes the properties of a material to make it easier to machine. Annealing does this by increasing ductility and reducing hardness for the material. AIP Precision Machining has programmed annealing ovens for plastics that heat the material above its recrystallization temperature. By maintaining the heat at that specific point, the structure of the material changes to become finer and more uniform. This process relieves internal stresses in the material. The final part of annealing is allowing the material to cool back down once after it’s been heated for a suitable amount of time. Proper annealing requires precise temperatures and timing control to accomplish the right result, which is why AIP uses computer controlled annealing ovens for plastics. Why is annealing & stress-relieving crucial for plastics? While not every machined component has to rely on annealing, we at AIP believe it is an important part of the plastic machining process for several reasons. For one thing, it reduces stress in the material. Plastics that experience internal stress can turn out warped or cracked, have inferior physical properties, or finish with unexpected changes in their part dimensions. Obviously, we want to avoid this as much as possible. Reducing stress enhances the mechanical and thermal properties of a material by limiting the opportunity for cracking and other issues like the ones above. Since stress build-up can lead to part failure or reduced performance, stress-relieving improves the overall quality of your product. By doing this, annealing extends the life of your machined plastic parts and components. Is the process of annealing plastics the same for different materials? Not at all. Some engineering plastics like ULTEM and TORLON benefit enormously from post-machining annealing. At AIP, proper annealing of TORLON can require more than seven days in special ovens! Other materials that will undergo a lot of machining time, like some applications of PEEK, can require more intermediate annealing steps to make sure they maintain critically tight tolerances and flatness. That means it’s essential for your machinist to know what plastic material you’re working with and what particular needs it has. Be sure you’re working with an experienced plastics manufacturer like AIP or else you risk having a lower quality product. With over 35+ years of experience working with hundreds of polymers and composites, we’re more than just familiar with the machining process. We’re ready to handle any geometry and any challenge. Want to Learn More about Plastic Machining? You can follow AIP Precision Machining on LinkedIn, Twitter, Facebook or Google+, so that you can keep up with the latest from the plastics professionals! Posted in Plastic Machining, Plastic Manufacturing CompanyTagged Materials, Plastics, Precision Machining1 Comment on What’s the Purpose of Annealing & Stress-Relieving Plastics? Cup holders. Magazines. Suit cases. Aircraft engines. Here’s a riddle, what do these items all have in common? If you’re an aircraft operator, the answer is obvious: they all add weight, making them a drain on your fuel costs. If weight is one of the main operating costs of an aircraft, then it’s no surprise that airlines want to lose a few pounds. Over the last 35 years, AIP has witnessed firsthand the incredible weight savings that can be gained from using lightweight polymers and composites for aerospace applications. How much can an ounce cost you? Plenty. In the case of United Airlines, removing a single ounce from its in-flight magazine has translated to saving $290,000 a year. Yes, a single ounce can hit an airline with up to six digits in costs. If thinner paper can have such an impact on your bottom line, then you can imagine the significant cost savings that can come from manufacturing lighter aerospace components. What’s the most lightweight solution for aircraft operators today? We have one word for you: plastics. Aluminum was popular during the “Golden Age of Aviation” because of its strength and durability as well as its lightness when compared to other metals like steel. As a result, many aircraft components have traditionally been metal, from aircraft interiors, to landing gear, aircraft engines and structural components. Now consider the fact that polymer and composite materials can be up to ten times lighter than metal. It’s no wonder that as more thermoplastic materials come on the market and new manufacturing opportunities arise, metal replacement has been seen as one of the best opportunities to reduce airline weight. 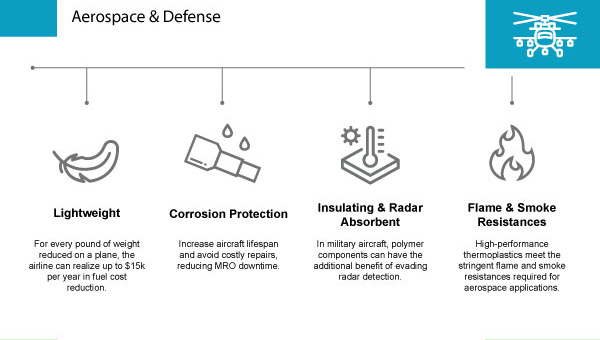 How big is the impact of switching from aluminum to plastic parts like PEEK and ULTEM in aerospace applications? Operators can earn weight savings of up to 60%. This translates to lower lifetime fuel costs, reduced emissions and extended flight range for operators. Weight alone is a massive reason to consider thermoplastics for aerospace, but weight isn’t the only factor at play in material selection. After all, wood is lighter than metal, but there’s a reason we don’t build spruce airframes like the first plane from the Wright brothers: it wouldn’t be safe today to fly a wooden plane! Aerospace components need to be able to survive in corrosive, harsh environments as well as provide resistance to high temperatures. In other words, it’s crucial that your mission-critical components aren’t just lightweight, but also high-performing. At AIP, we carefully apply our decades of material expertise to select the right material for your application’s needs. Remember that your aerospace plastics manufacturer should understand the unique demands of your industry and your application, and have experience machining the material you require. Want to learn more about how AIP reduces costs for aircraft operators? Read how machined polymer components can take a load off aircraft interiors in our aerospace case study.